Little Dalia lives with her brothers, Miguel and Fernando, and her dad, Boris, in the southern-Bolivian city of Sucre. Dalia rarely sees her mother, Alcira, who relinquished custody of the children when she separated from their father. Boris sells food in a market stand to earn enough to cover the family’s rent, food, and basic utilities. 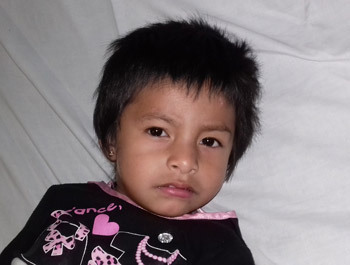 Dalia appeared to be a normal, healthy child until she came down with a serious respiratory illness with fever. When she didn’t get better, Boris took her to the public Children’s Hospital in Sucre, where they attributed her persistent illness to an underlying heart defect. The doctors connected Boris to various foundations, and eventually Dalia was approved for assistance through Puente de Solidaridad and Dharma Social Projects which made it possible for Dalia’s cardiac malformation to be treated at the prestigious Incor Hospital in Santa Cruz. Boris left his two sons in the care of an aunt in Sucre to travel with Dalia to Santa Cruz, where other relatives accompanied them throughout their hospital stay. Boris was overjoyed with the support received: I have to work every day, and I don’t have any way to pay for surgery for my daughter … I am very grateful for your help!